Flying from Townsville to Devonport was a bit tedious. We knew it was going to be a long day anyway, with two stops along the way, but QANTAS made changes to their flight schedule and we didn’t get to Devonport until just after 8pm after starting our journey at 9.20am. Enough about that! Devonport airport is a lovely small facility with friendly staff. 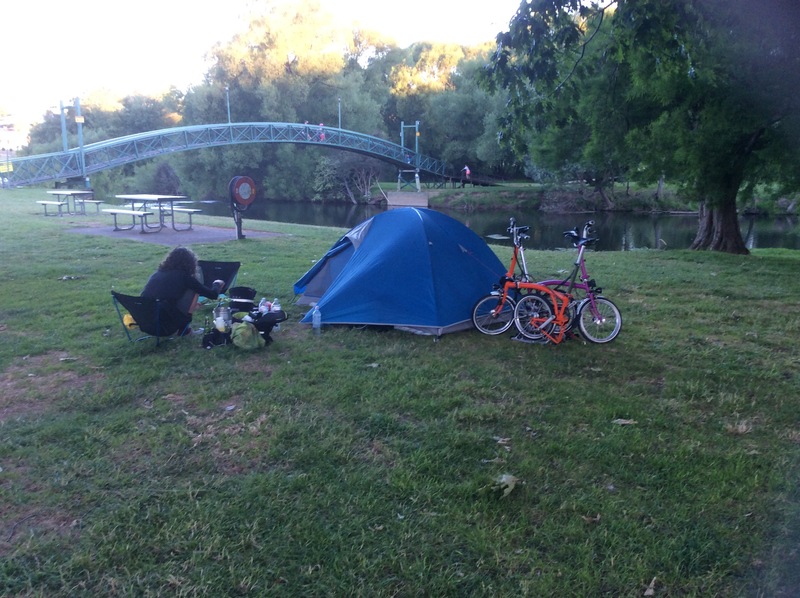 The guy who was closing up for the night chatted to us as we unpacked our Bromptons (so easy compared to a regular bike!) and took our boxes and rubbish away so we didn’t have to. 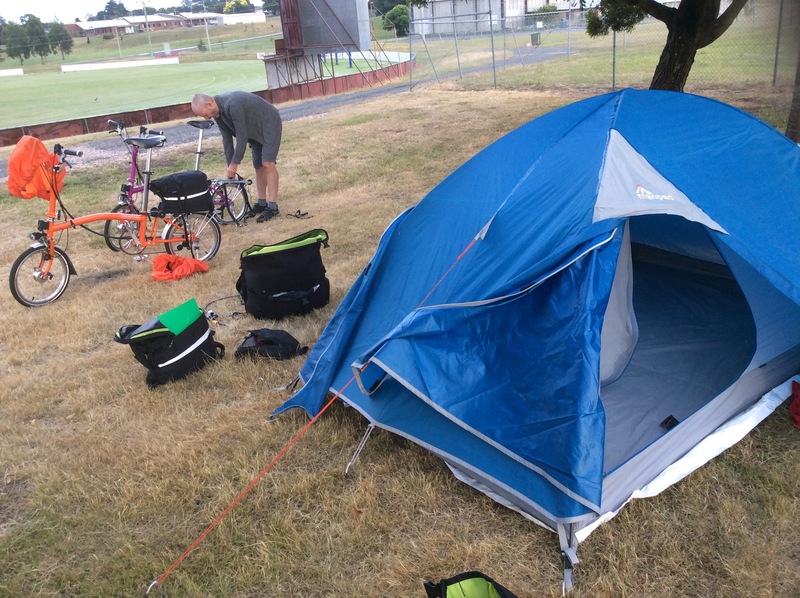 We camped at Girdlestone Park in Devonport that night. It was about 5km from the airport, and with only two other vans in the park, made for a quiet night. There are no showers, but there is a toilet and a tap to get water. Best of all was the soft grass and level ground near a tree we used to pitch our tent on! Being diligent airline travellers, we did not bring any methylated spirits in our luggage to fuel our Trangia stove. This meant the morning’s pack-up proceeded rather quickly with both of us being awfully polite to one another. Mornings without the cup of tea have to be handled very carefully! It still took us until nearly 8am to be ready and we hightailed it over to the Devonport CBD to get some breakfast and supplies. By 9.30am we had visited the tourist info centre, sorted out a route and set off towards Sheffield into drizzly rain. Heading over the river into Devonport CBD. We headed towards Forth, then turned left towards Melrose, ended up on Nook Rd, then arrived in Sheffield. Unless you look at a map, this probably won’t mean much to you, but it was a beautiful route with few cars and pleasant Tasmanian scenery. There were also plenty of climbs, climbs so steep that at some points we were riding below 5km an hour! Jen even got off and walked twice! Once you get down to 4.5km/hr walking can be easier than trying to steer the bike! Mick struggled on however, and didn’t concede to walking. It quickly became obvious that our fitness levels and hill strength had declined quite a lot since we were living in Tassie. This ‘holiday’ trip was turning out to be darn hard work! The drizzly rain stopped after a couple of hours. By the time we got to Sheffield we had ridden 50km and taken a mere THREE AND A HALF HOURS! It was obvious our Brompton tour was going to be very different to any other trip we had ever done before. Mick pointed out that the hills kept us warm and the rain kept us cool. The weather and the terrain was perfect for pleasant cycling (just a bit steep…). Pleasingly, the gear ratios on the Bromptons seemed adequate. They just didn’t seem to correspond with the gear ratios in our legs! 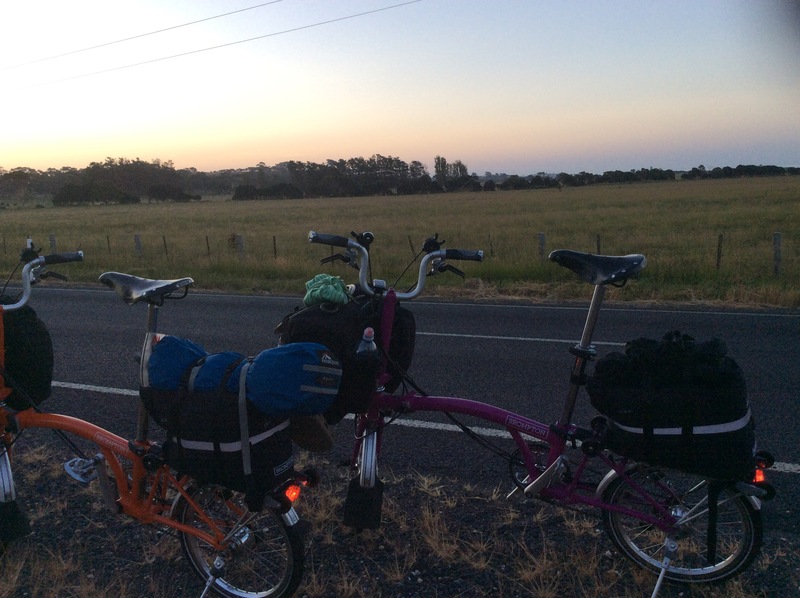 On the advice of the helpful staff at Sheffield Tourist Info Centre, we decided to ride to Deloraine via Mole Creek. It would be another 50km, a fair bit longer than the main route, but quieter and more beautiful. At least the woman warned us of the two hilly sections along the way. By the time we were tucking into a homemade lamb pie at the Mole Creek pub (absolutely delicious and worth a stop!) we were shattered. There was still 25km to go to Deloraine and it was about 4pm in the afternoon. 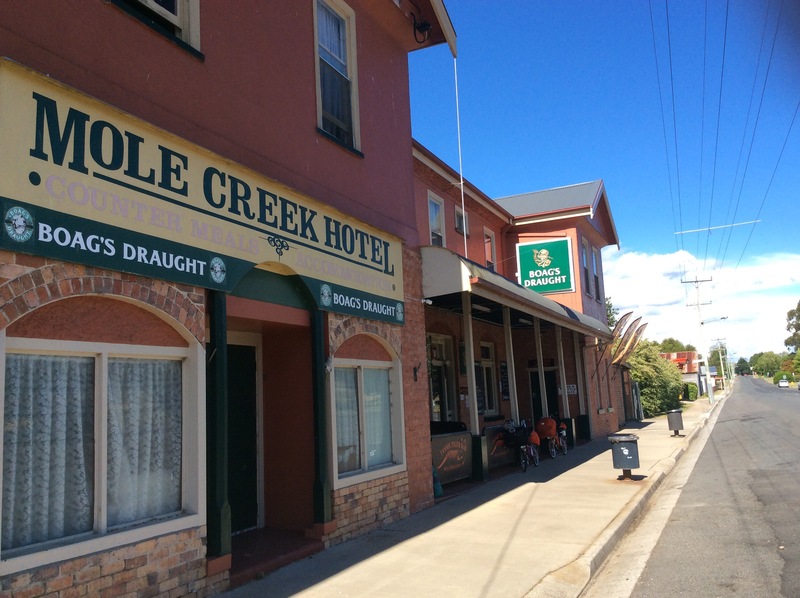 Mole Creek Pub – delicious homemade lamb pies! The final 25km were ‘Tassie flat’, and although we still struggled to get up the remaining hills on our tired legs, the climbs weren’t as great and we had the promise of beer to tempt us on. At 6pm we finally made a triumphant arrival into Deloraine where we paid $25 for a site at the riverside Caravan park complete with (pesky) ducks and soft green grass and platypus. By the time we set up camp, showered, did the washing and walked to the supermarket for food, it was 7.30pm. Jen cooking up some dinner on the Trangia. One of the fantastic things about. Tasmanian summer is the light! It doesn’t get dark until after 9pm! It had been a looong day, another brilliant start to a cycle touring holiday (well…that could be debatable) and we were ready for bed! 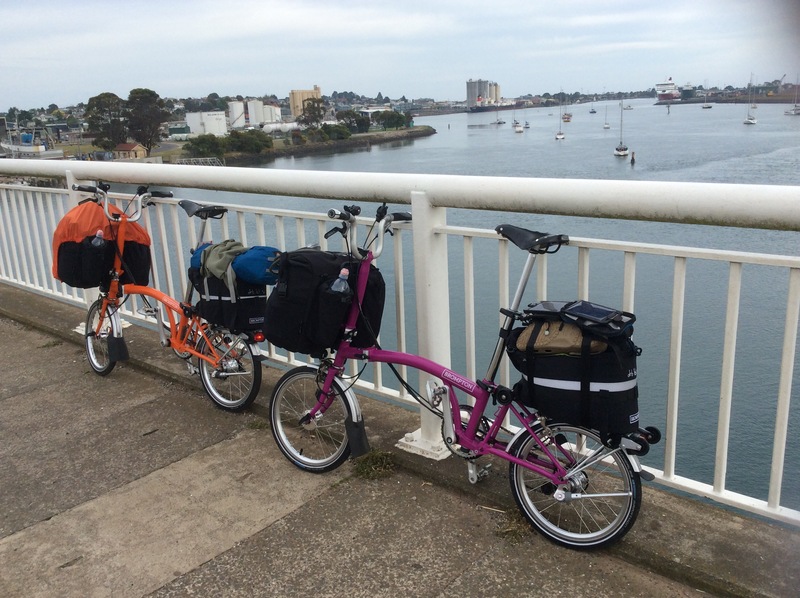 I can see you’re no stranger to bicycle touring in Tassie, but if this is your first trip on Bromptons then I can’t say I’m surprised at your experience. 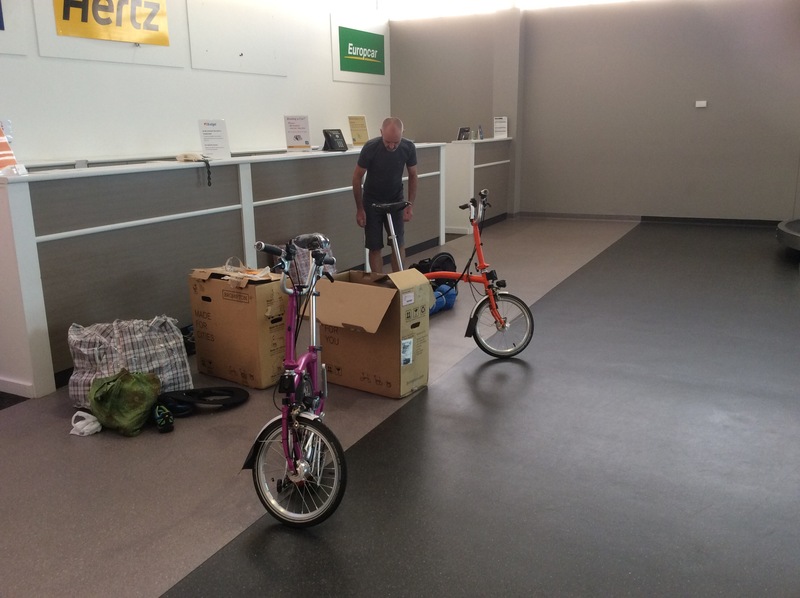 On of our (Melbourne Brompton Club’s) newest members are ususually road cyclists. They have toured Japan by bike many times, but for their most recent trip decided to try taking Bromptons instead of hiring road bikes over there. 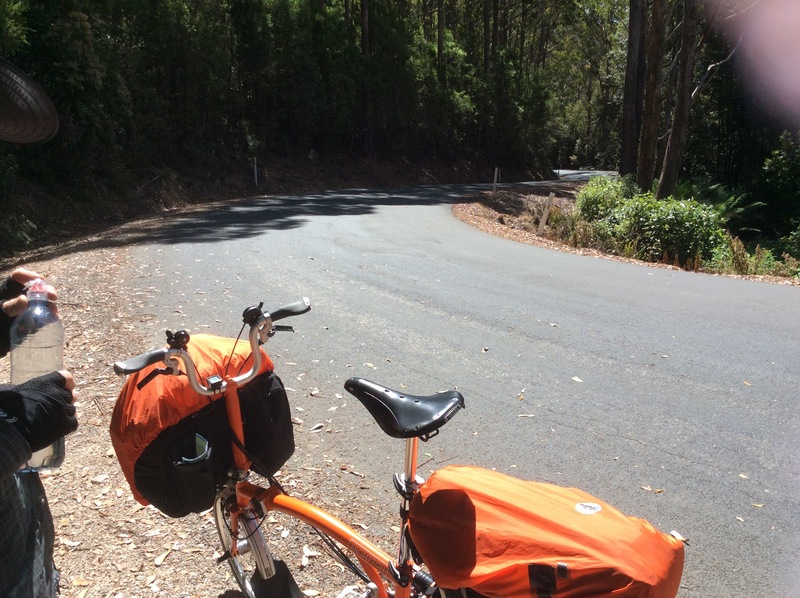 My partner and I love Tasmania and know the towns you’ve passed through and roads you’ve ridden in this post with some familiarity. I am not at all surprised to hear the word “hilly” being used more than once! I WAS hoping you might know secret backways that weren’t so ‘lumpy’. Mind you, if I was doing your route my stop for Day 1 would have been Deloraine! Thank you Jill! Where are you at the moment?